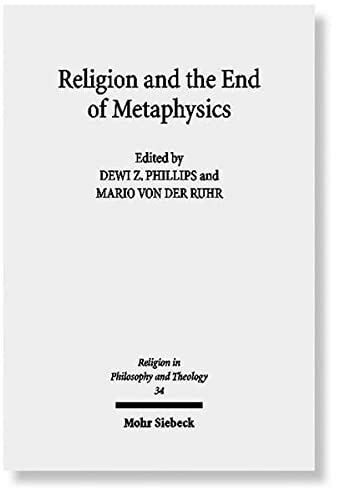 The authors of this volume present a detailed philosophico-theological discussion of the relation between religion and metaphysics. If thinkers like Richard Rorty and Kai Nielsen are right to insist that metaphysical speculation must be abandoned for good, then what are the prospects for religion? Is belief in an omnipotent God not inexctricably linked with belief in a metaphysical ground of all being? Indeed, can one even speak intelligibly about causal or moral necessity without invoking the notion of a transcendent reality? On the other hand, is the concept of metaphysics not as multi-faceted as the modes of religious discourse themselves? The contributors approach these questions from their own distinctive (philosophical and theological) perspectives, in the process disentangling some of the complex conceptual issues surrounding religion and metaphysics. Dewi Z. Phillips, was Rush Rhees Research Professor, University of Wales, Swansea and Danforth Professor of the Philosophy of Religion at the Claremont Graduate School, CaliforniaMario von der Ruhr, is Lecturer in Philosophy at Swansea University, UK.